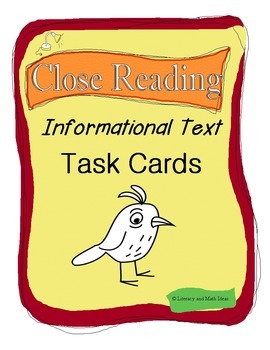 This document contains task cards for reading informational text. One of the greatest secrets to being able to closely read text is knowing what to focus on while reading. 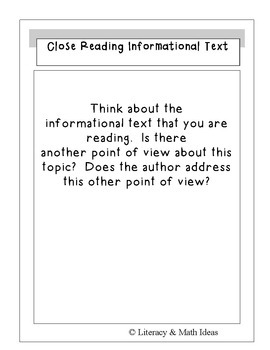 These 20 task cards cover the most common types of details that readers are expected to focus their attention to when they read informational text, listen to speeches, or take school assessments. 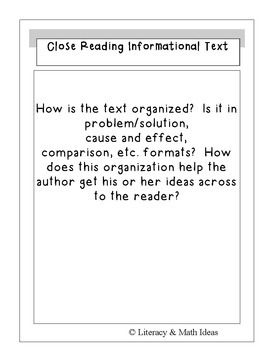 Use these task cards with any informational text. Use these as journal writing or small group discussion prompts. A printable, easy-fold box is included for storage. Click the follow button to receive updates about additional resources.